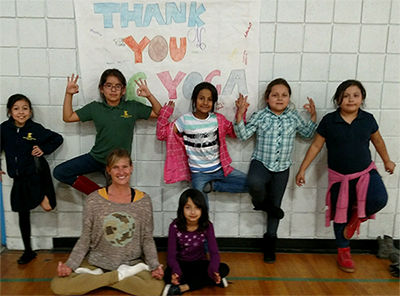 2017 is coming to an end and we are grateful that non-profit OG Yoga is heading into its 3rd year offering yoga, meditation, and mindfulness to underserved and vulnerable communities of San Diego. It’s been an amazing journey so far, and we've succeeded because of the help and support of our donors, sponsors, volunteers, and partners. Let’s look back at 2017 to see how we’ve grown and who we’ve helped, and look ahead to what our mission will be going forward. Increased OG Yoga programming to underserved senior adults with weekly classes at the Alternative Healing Network Tubman Chavez partnership. Served more children through Boys & Girls Clubs pop-up events and new weekly Integrity School/B & G Clubs- Payne Family Branch partnership under ACEs grant and formalized MOU for earned income. Added Naval Consolidated Brig programming for military prisoners. Added Girls Rehabilitation Facility for incarcerated youth. Added Braille Institute weekly class to serve vision-impaired seniors. 2nd year in a row to be awarded lululemon’s “here to be” regional funding. OG Yoga Founder, JoAnn Jaffe, awarded Fieldstone Leadership Network Mentoring Grant and paired with John Malashock – Founder Malashock Dance. JoAnn Jaffe invited to be lululemon Fashion Valley Ambassador. Awarded grant request funding from the Cushman Foundation to increase youth classes. JoAnn Jaffe interviewed by KPBS Midday Edition First Person Show. Joined Yoga Service Council for Best Practices. lululemon La Jolla hosted event in partnership with La Valencia Hotel for 16-week “Savasana at Sunset” series, resulting in $8,000 and 300 new donors. lululemon Fashion Valley hosted event in partnership with Hotel Del Coronado and CorePower Yoga for 6-week “Take A Holiday Breath” series, resulting in $7,000 and 200 new donors. Women, Wine & Yoga hosted “Yoga for Good” event series, raising $7,000 and 200 new donors. OG Yoga invited to participate in the San Diego Accelerator and Incubation Lab (SAIL), resulting in a 3-minute pitch at Qualcomm Auditorium for OG Yoga’s new social enterprise launching in 2018. OG Yoga delivered two-day “What is Service Yoga?” Workshop to 25 attendees and earned $3,600 in revenue. Studio Ambassador support with donation classes. Converted to Network For Good Donor Management and Communication software. First time participating in “Giving Tuesday” and “Calling All Angels” appeals. MOU’s submitted and pending with Neighborhood House, Lindsay School and San Ysidro Health Center. Deliver two-day “What is Service Yoga 2.0 (WISY)?” Workshop (April 2018). Partner with Pilgrimage Yoga in their 3rd Annual San Diego Celebration of the UN International Day of Yoga Festival (June 2018). Launch Service Yoga Teacher Training School (June 2018). Bring WISY workshop on-site to yoga studios. Add two new partnerships with nonprofit organizations. If you’d like to get involved with OG Yoga in 2018, we’d love to hear from you– whether you’re a yoga instructor, a nonprofit, or an individual looking to give their time, talent, and resources to help provide yoga, meditation, and mindfulness to underserved and vulnerable communities. Thank you again to all of our donors, sponsors, volunteers, and partners who have helped OG Yoga in our start-up years. Help us Give Peace. As you consider year-end giving, please consider joining our passion to bring yoga to those in need. Even a donation of $5 to $10 can make an impact. Every $150 we raise pays for an entire class for a group of people in need.